Subjects: Data were collected at a structured sample of 28 gun shows in California, which regulates these events and prohibits undocumented private party gun sales; and in Arizona, Nevada, Texas and Florida—all leading sources of California’s crime guns—where these restrictions do not exist. Main outcome measures: Size of shows, measured by numbers of gun vendors and people in attendance; number and nature of guns for sale by gun vendors; measures of private party gun sales and illegal surrogate (“straw”) gun purchases. Results: Shows in comparison states were larger, but the number of attendees per gun vendor was higher in California. None of these differences was statistically significant. Armed attendees were more common in other states (median 5.7%, interquartile range (IQR) 3.9–10.0%) than in California (median 1.1%, IQR 0.5–2.2%), p = 0.0007. Thirty percent of gun vendors both in California and elsewhere were identifiable as licensed firearm retailers. There were few differences in the types or numbers of guns offered for sale; vendors elsewhere were more likely to sell assault weapons (34.9% and 13.3%, respectively; p = 0.001). Straw purchases were more common in the comparison states (rate ratio 6.6 (95% CI 0.9 to 49.1), p = 0.06). Conclusions: California’s regulatory policies were associated with a decreased incidence of anonymous, undocumented gun sales and illegal straw purchases at gun shows. No significant adverse effects of these policies were observed. Little is known about gun shows, beyond anecdotal data gleaned from criminal investigations, and no evaluations have been published of policies regulating them. This study was undertaken to help address those deficits. It describes a structured sample of gun shows and assesses one state’s efforts to reduce the importance of gun shows as sources of crime guns. There are more than 4000 gun shows annually in the US.10 Federal statutes do not regulate them. They play a unique role in gun commerce, stemming from the fact that licensed firearm retailers, unlicensed gun vendors who display their inventory at a fixed location, and individual attendees who walk the aisles selling guns, are all present and competing against one another. Such unlicensed vendors are reported to make up 25–50% of all gun vendors at gun shows.10 In all but a few states, they may ignore the identification requirement, cannot initiate background checks, and need not report multiple sales or keep records. The same is true for individual attendees at gun shows who bring guns to sell. California has also largely outlawed direct sales of guns between private parties. These transactions must be processed by a licensed retailer; a background check is conducted and a record is kept. The state has banned the sale of certain firearms, including rifles in .50 BMG caliber and handguns (generally very inexpensive) that fail basic safety tests. Military-style assault weapons that accept detachable ammunition magazines are restricted, but similar designs with fixed magazines are not. Other than California itself, the four leading sources of guns used in crime there are Arizona, Nevada, Texas and Florida.16 None of them regulates gun shows or private party gun sales.17 Gun shows are held frequently in all five states. One major promoter organizes shows in California, Arizona and Nevada; another does in California and Arizona. This offered the opportunity to compare shows having organizers and many vendors in common but occurring in different regulatory environments. Given these policy differences, we expected to see fewer private party sales and fewer sales of assault weapons in California. We also hypothesized that California’s regulations would adversely effect attendance and commercial activity. We expected no difference in the incidence of straw purchases, which are illegal nationwide. Gun shows are recurrent events; a promoter typically organizes a show at the same venue at intervals of one or more months. A structured sample was selected that included at least one example of every show organized by a major promoter and occurring in a major metropolitan area of California, Arizona or Nevada. Additional shows were selected on a convenience basis from major metropolitan areas in Texas and Florida. Shows in the study took place between April 2005 and March 2006. 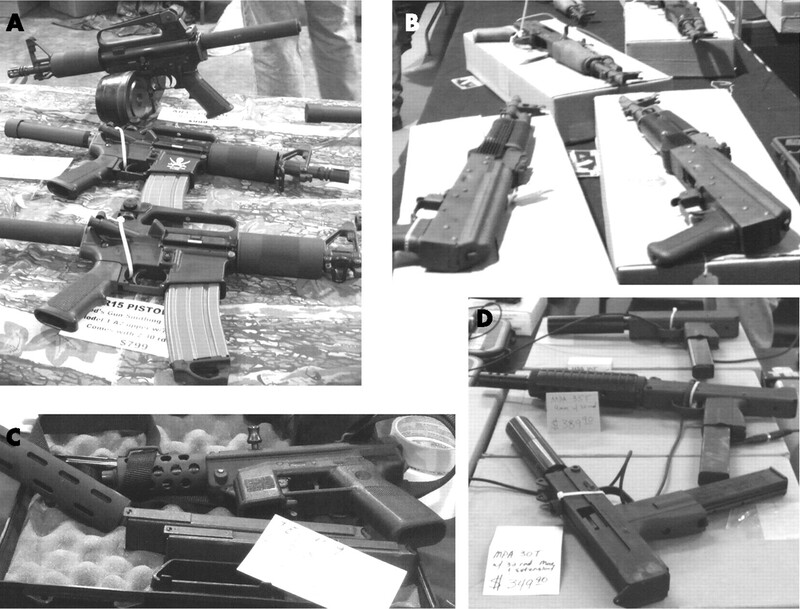 Figure 1 shows a hypothetical gun show; photographs of representative firearms taken as part of the study are in figures 2–3 and Appendix figure 1 (for Appendix please visit http://ip.bmj.com/supplemental). A simplified diagram of a hypothetical gun show with five rows of vendors. Examples of assault-type long guns. (A) SKS-type rifles. These guns were equipped with bayonets in most instances, as seen here. (B) AK47-type rifles. (C) An AR15-type rifle, which is being offered for private (undocumented) sale. Examples of assault-type handguns. (A) AR15-type pistols. The gun in the rear is equipped with a 100-round magazine. (B) AK47-type pistols. (C) A TEC9 pistol. (D) MAC-type pistols. An area just inside the entrance to the event commonly served as a marketplace for private party gun sales, but they also occurred elsewhere. While most vendors occupied a single display table, larger vendors took up several adjoining tables and in some cases fronted more than one row of the show. Not all vendors sold guns (other products commonly sold included ammunition, knives and swords, and gun parts). Gun vendors were vendors occupying one or more display tables and offering five or more guns for sale or selling fewer guns that occupied at least one third of their display space. Licensed firearm retailers were gun vendors who displayed a federal firearms license, had business cards identifying them as licensed retailers, or at whose table(s) the forms required when buying firearms from a licensed retailer were observed. When none of these criteria was met, a transaction was observed if possible to see if the forms were produced at that time. Individual attendees were people in the customer space of the show. Guns brought to the show by armed attendees were clearly marked by staff at the entrance to indicate this. Armed attendees often had “For Sale” signs affixed to their guns or to themselves and carried the guns prominently so as to attract attention to them. Attendees whose guns were marked as having been sold to them by a vendor at the show were not classified as armed attendees. A private party gun sale was defined as a sale between a gun vendor and attendee, or between attendees, that did not include completing the forms required for a purchase from a licensed retailer. A gun sale was classed as a straw purchase only if the purchase was made from a licensed retailer, the required forms were completed, and there was clear evidence that the person purchasing the firearm was not the intended possessor. Attendees were often observed conducting cellphone conversations about guns they were examining and using their phones to photograph the guns. Purchases associated with these activities were not classified as straw purchases. Data acquisition followed a standardized procedure, developed and tested by the author at 15 previous shows. Observations were made on a Saturday in 19 cases and a Sunday in 9, and counts of attendees were taken between 11:00 and 13:00 hours. 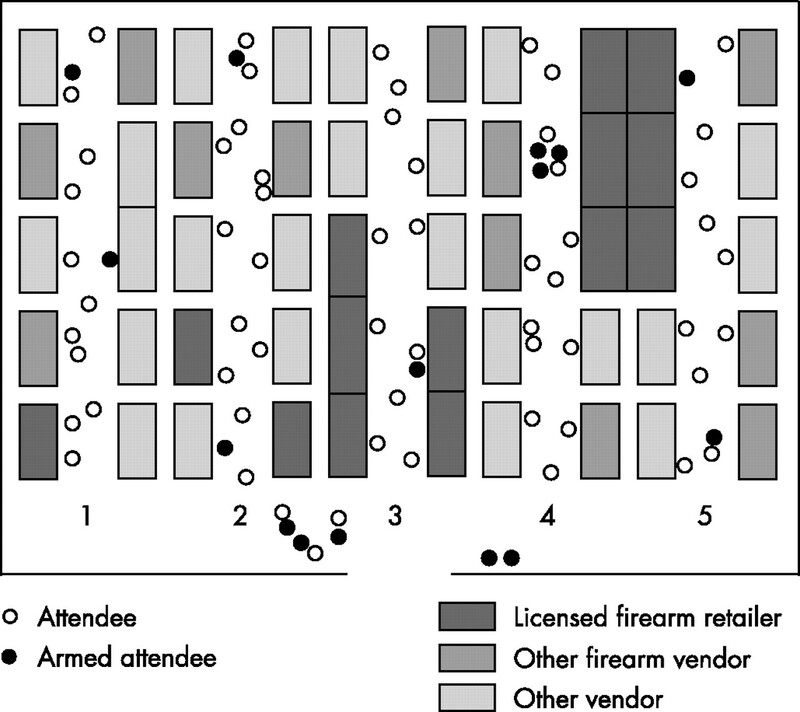 After determining the general structure of the show (fig 1), an observer (the author) counted the numbers of vendors, individual attendees, and attendees who were armed and appeared to be selling guns for a systematic sample of the rows of vendors at the show. The sampling interval was determined by the size of the event. The observer then walked the entire show in row order, enumerating the gun vendors and collecting data on a systematic sample. The sampling interval again varied. A visual determination was made of whether each sampled vendor was a licensed firearm retailer. Guns on display were counted by type (handgun, long gun) and the presence of assault weapons (figs 2–3) and .50-caliber rifles (Appendix fig 1) was noted. The observer then monitored gun sales and collected anecdotal data, walking through the show in a non-patterned manner. At most shows, some time was spent in the parking lot. Two shows in Reno provided an opportunity to observe whether California residents attended shows in less-restrictive Nevada. (The facility was physically isolated, and no other events were being held.) Vehicles outside the area used by vendors were classified by license plate inspection as being from Nevada, California, or elsewhere. The data collection process was unobtrusive. Observations were recorded as they were made, using a cellphone and a voicemail system. This did not attract attention, as cellphone use was very common. The author provided training for project staff. Recordings were transcribed by one staff member, and transcriptions were reviewed for accuracy by the author. Quantitative data were coded for analysis by one of two staff members and the coding verified by the other; samples were re-verified by the author. Estimates for entire shows from row-level data were computed by multiplying averages for sampled rows by the total number of rows. Continuous variables were summarized using medians and interquartile ranges (IQRs). Differences between results for gun shows in California and comparison states were assessed using a two-tailed Wilcoxon rank-sum test for continuous variables or a Mantel–Haenszel χ2 test for categorical variables. Rates for straw purchases were calculated as events per hour of observation time and compared using Poisson regression. A p value of <0.05 was taken as the threshold for statistical significance; all tests were two-sided. The study was approved by the institutional review board of the University of California, Davis. Data were collected at 28 gun shows: 8 each in California and Nevada, 6 in Arizona, 4 in Texas, and 2 in Florida. Altogether, 139.3 h of observation time were logged (30.2 in California and 109.1 in other states), an average of 5.0 h per show. Twenty-three shows were held at public facilities (12 at county fairgrounds and 11 at convention centers); 15 were organized by a promoter active in California and at least one contiguous state. Shows in comparison states were larger than those in California, whether measured by number of vendors or number of attendees, but the number of attendees per gun vendor was higher in California. (For all shows in the study, see table 1; for the subset of shows presented by the two major regional promoters, see Appendix table 1.) None of these differences was statistically significant. Armed attendees were more than five times as common in other states as in California (median 5.7% and 1.1%, respectively, p = 0.0007). At a show in Phoenix, 31.6% of attendees were armed. Data were collected for 272 gun vendors: 60 in California and 212 elsewhere. In both groups, 30% of vendors were identifiable as licensed retailers (table 2, Appendix table 2). Handgun vendors were more prevalent in other states; there was no difference among handgun vendors in the proportion selling inexpensive handguns. California gun vendors were less likely than others to sell assault weapons (13.3% and 34.9%, respectively, p = 0.001, figs 2–3), and all such guns seen in California were of designs that are permitted there. All sellers of assault-type handguns and fully automatic weapons were in other states. No California vendor sold .50 BMG rifles, but two vendors in the sample and others observed anecdotally sold rifles in the similar but non-prohibited .50 DTC caliber (Appendix fig 1). Gun vendors in California and elsewhere had similar numbers of guns for sale (California, median 22, IQR 14–55; comparison states, median 26, IQR 14–50; p = 0.57). Among vendors selling guns of any specific type, there were no significant differences in the number or percentage of guns displayed that were guns of that type (Appendix tables 3–4). Licensed retailers had more guns for sale than did other gun vendors, both in California (licensee median 42, IQR 15–90; other vendor median 21, IQR 13–36; p = 0.12) and in other states (licensee median 52, IQR 26–100; other vendor median 20, IQR 11–33; p<0.0001). Licensed retailers were more likely to sell assault weapons (California: 27.8% and 7.1%, respectively, p = 0.03; other states: 60.9% and 23.7%, respectively, p<0.0001). They were more likely to sell inexpensive handguns in other states (23.4% and 4.1%, respectively, p<0.0001) but not in California (11.1% and 7.1%, respectively, p = 0.61). No private party gun sales between attendees were observed in California. Two direct sales were observed between attendees and the same apparently unlicensed gun vendor (table 3). Elsewhere, private party sales appeared about equal in number to sales involving licensed retailers (table 3; http://ip.bmj.com/supplemental). They generally required less than 5 min to complete, and sometimes less than 1 min. In only one sale between attendees was identification or verification of in-state residence requested. It was uncommon in sales involving an unlicensed vendor. Unlicensed vendors sometimes identified themselves by posting prominent signs. One vendor in Phoenix, whose signs read “PRIVATE PARTY SALE” in English and Spanish, displayed AK47-type and AR15-type assault rifles and AR15-type pistols. One straw purchase and one probable straw purchase were observed in California; 24 definite and three probable straw purchases were observed elsewhere (table 3). In three cases, all outside California, straw purchasers bought multiple guns in one transaction. One licensed retailer in Florida processed multiple straw purchases simultaneously. Counting only definite cases, the rate ratio (per hour of observation) was 6.6 (95% CI 0.9 to 49.1, p = 0.06) for shows in comparison states as compared to those in California. No illegal activity resulting in police action was seen; some illegal purchases took place with police officers in the immediate vicinity. Parking lot transactions were rare. At the two Reno shows where vehicle licensure was recorded, 31% and 32% of vehicles bore California license plates. These limited data suggest that gun shows can be regulated so as to diminish their importance as sources of crime guns without greatly diminishing attendance or commercial activity. While shows in comparison states were larger, the number of attendees per gun vendor was higher in California, and these differences were not statistically significant. Gun vendors in California and elsewhere were also similar on most measures. Most observed differences, whether for shows or vendors, were predictable; they arose from the absence in California of specific activities and products that are banned there. Straw purchases were also more common in comparison states. This seems counterintuitive: why risk a straw purchase from a licensed retailer when an anonymous purchase is easily accomplished? These data suggest an answer: that licensed retailers have larger inventories and allow illegal buyers a wider selection. This proposition would be unconvincing if the risk of apprehension during a straw purchase was high. But only once, at a show attended while developing the methodology for this study, did a retailer refuse to conduct an obvious straw purchase. Police action was never seen. The frequency of straw purchases may explain conflicting earlier findings. Gun shows are frequently implicated in trafficking investigations,4,6 yet less than 2% of felons incarcerated for crimes involving guns had acquired those guns themselves at gun shows.19,20 Others may have used surrogates instead. Gang members, for example, may be unable to travel to a gun show.21 Camera-equipped cellphones would facilitate straw purchases by making the intended possessor’s presence unnecessary. We identified only 30% of gun vendors as licensed retailers, less than the 50–75% reported by the ATF.10 Our results relied on direct observation, while the ATF may have obtained data from show promoters. Licensed retailers may, understandably, not identify themselves as such until a gun purchase is being completed and the required forms must be produced. When private party gun sales are permitted, licensed retailers may be at a competitive disadvantage. Buying from them involves paperwork, a background check, and sometimes a waiting period; buying from an unlicensed vendor or another attendee is simpler and faster. For those who expect to fail the background check, purchase from a licensed retailer is not an option. Several times we observed an attendee negotiate the purchase of a firearm, only to break off on learning that the vendor was a licensed retailer. California regulates gun shows and largely prohibits undocumented private party gun sales. Most other states do not. Nonetheless, gun shows in California and comparison states were similar on most attributes examined. 30% of gun vendors both in California and elsewhere were identifiable as licensed firearm retailers. Vendors elsewhere were more likely to sell assault weapons. Armed attendees who appeared to be selling guns were more than five times as common at shows in states where undocumented private party sales are permitted. Illegal “straw” purchases of guns were more common (rate ratio 6.6 (95% CI 0.9 to 49.1), p = 0.06) in states with less regulation. Gun shows may serve as a point source for assault weapons and .50-caliber rifles. Our findings in this exploratory study are subject to several limitations. The shows studied were not a random sample, and events outside major metropolitan areas were excluded. The size of the study limits its statistical power. Some findings may be subject to observation bias; gun sales that were observed and licensed retailers who were identified may each have differed from those that were not. We have only imprecise measures of commercial activity. Detailed information on transactions and interviews with vendors and attendees would be helpful. We have grossly underestimated the incidence of straw purchases, as only 1 observer was present and such transactions may be more common on Sundays;7 rate ratios should be less affected. Our results will need validation by teams of observers at shows nationwide. These findings suggest a basis for action by policymakers to regulate gun shows and prohibit undocumented private party gun sales. The latter initiative has been endorsed by as much as 77% of the general public and 72% of gun owners23 and repeatedly by American President George W Bush.24,25 These data suggest that action by individual states may produce displacement effects; federal policy reform would be preferable. Police agencies should be more active at gun shows. International trafficking in American firearms is of such magnitude that the ATF maintains offices in Canada, Mexico and Colombia26 and will be providing direct access to its gun tracing capabilities to these nations and seven others.27 Action taken on gun shows in the US could help prevent firearm violence in other countries. The author thanks Jeri Bonavia for suggesting a study of gun shows and for much else besides, and Barbara Claire and Vanessa McHenry for expert technical assistance. Catalano SM. Criminal victimization, 2005. Report No NCJ 214644. Washington, DC: Bureau of Justice Statistics, 2006. Federal Bureau of Investigation. Crime in the United States, 2005. Report No NCJ 214256. Graduate Institute of International Studies. Small arms survey 2002: counting the human cost. Oxford, UK: Oxford University Press, 2002. Bureau of Alcohol, Tobacco and Firearms. Following the gun: enforcing federal laws against firearms traffickers. Washington, DC: Bureau of Alcohol, Tobacco and Firearms, 2000. Bouchard M. Statement of Michael Bouchard, Assistant Director/Field Operations, Bureau of Alcohol, Tobacco, Firearms and Explosives. Oversight of the Bureau of Alcohol, Tobacco, Firearms and Explosives. Part 2: Gun Show Enforcement. Hearing before the Subcommittee on Crime, Terrorism, and Homeland Security 109th Congress, 2nd Session (28 February 2006). Braga AA, Kennedy DM. Gun shows and the illegal diversion of firearms. Georgetown Public Policy Review2000;6:7–24. Hawley C, Solache S. U.S. guns pour into Mexico: arms race among drug cartels, end of ban in America result in flood of high-power weapons over border, The Arizona Republic. 2007 January 16. Available at http://www.azcentral.com/arizonarepublic/news/articles/0116americanguns0116.html (accessed January 2007). Montgomery S. Gunrunner gets six years. The Gazette (Montreal). 2006 May 27. Available at http://www.canada.com/montrealgazette/news/montreal/story.html?id=66aa79c0-190f-4c46-8c6d-d7759ef42baa&k=60047 (accessed June 2006). Criminal Intelligence Service Canada. Annual report on organized crime in Canada. Ottawa: Criminal Intelligence Service Canada; 2005. Available at http://www.cisc.gc.ca/annual_reports/annualreport2005/illegal_firearms_2005_e.htm (accessed August 2005). Bureau of Alcohol, Tobacco and Firearms. Gun shows: Brady checks and crime gun traces. Washington, DC: Bureau of Alcohol, Tobacco and Firearms, 1999. Bowling M, Lauver G, Hickman MJ, et al.Background checks for firearm transfers, 2005. Report No NCJ-214256. Washington, DC: Bureau of Justice Statistics, 2006. Cook PJ, Braga AA. Comprehensive firearms tracing: strategic and investigative uses of new data on firearms markets. Arizona Law Review2001;43:277–309. United States Code. Crimes and Criminal Procedure: Firearms. Title 18, Part 1, Chapter 44, Section 921(a)(21)(C). Gun Show Enforcement and Security Act of 2000. California Penal Code 12071.4 (2000). Wintemute GJ, Romero MP, Wright MA, et al. The life cycle of crime guns: a description based on guns recovered from young people in California. Ann Emerg Med 2004;43:733–42. Bureau of Justice Statistics. Survey of state procedures related to firearm sales, midyear 2004. Report No NCJ 209288. St Louis, Missouri: Bureau of Justice Statistics, 2005. Pierce GL, Braga AA, Hyatt RRJ, et al. Characteristics and dynamics of illegal firearms markets: implications for a supply-side enforcement strategy. Justice Quarterly 2004;21:391–422. Scalia J. Federal firearm offenders, 1992–98. Report No NCJ 180795. Washington, DC: Bureau of Justice Statistics, 2000. Harlow CW. Firearm use by offenders. Report No NCJ 189369. Washington, DC: Bureau of Justice Statistics, 2001. Cook PJ, Ludwig JA, Venkatesh SA, et al.Underground gun markets. Cambridge, MA: National Bureau of Economic Research, 2005. Kleinknecht W. Cops recover assault weapon, all but invisible to x-rays: Officials fear ‘nasty’ gun could slip past security at airports, public buildings. Newark Star-Ledger. 2006 April 28. Available at http://www.nj.com/news/ledger/jersey/index.ssf?/base/news-3/1146202660107270.xml&coll=1 (accessed May 2006). Teret S, Webster DW, Vernick JS, et al. Support for new policies to regulate firearms: results of two national surveys. N Engl J Med 1998;339:813–18. Commission on Presidential Debates. The second Gore-Bush presidential debate. 2000. Available at http://www.debates.org/pages/trans2000b.html (accessed March 2007). Commission on Presidential Debates. The third Bush-Kerry presidential debate. 2004. Available at http://www.debates.org/pages/trans2004d.html (accessed March 2007). Bureau of Alcohol, Tobacco Firearms and Explosives. ATF to open new office in Toronto. 2005. Available at http://www.atf.gov/press/fy05press/063005newtorontooffice.htm (accessed March 2007). Bureau of Alcohol, Tobacco Firearms and Explosives. ATF signs agreement with Germany to trace crime guns. 2007. Available at http://www.atf.gov/press/2007press/020907atf-germany-etraceagreement.pdf (accessed March 2007). Funding: This study was supported by a grant from The Eli & Edythe L. Broad Foundations and by an anonymous donation. Preliminary work was supported by a grant from the Joyce Foundation.